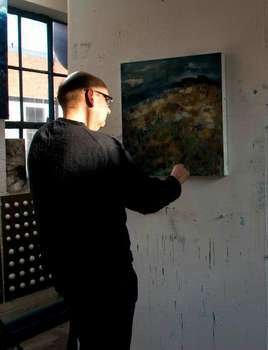 The main methods of my practice are painting, drawing, print-making and photographic means. I make work that has a strong sense of marks and lines that are a mixture of the instinctive, deliberate and accidental, often incorporating words or lines of texts. I try to maintain a direct use of colour and to reference the materials being used. Drawing is an essential process for me, charcoal an important medium and life drawing a basic discipline. I started life drawing in 1980 with John Epstein in London and continue to explore the instinctive approach he provoked. It is important for me to achieve a drawing full of movement, even from a static figure. I also undertake research that considers the historic significance of places and events. This investigates how the past is recorded and represented to determine how we understand and internalise it. How are facts constructed? I seek to bring this more thoughtful and conceptual approach into the range of work I undertake. In conclusion, my work is figurative in its inspiration and I seek to make pieces that are visually strong, aesthetic in quality and that continue to affect the viewer.